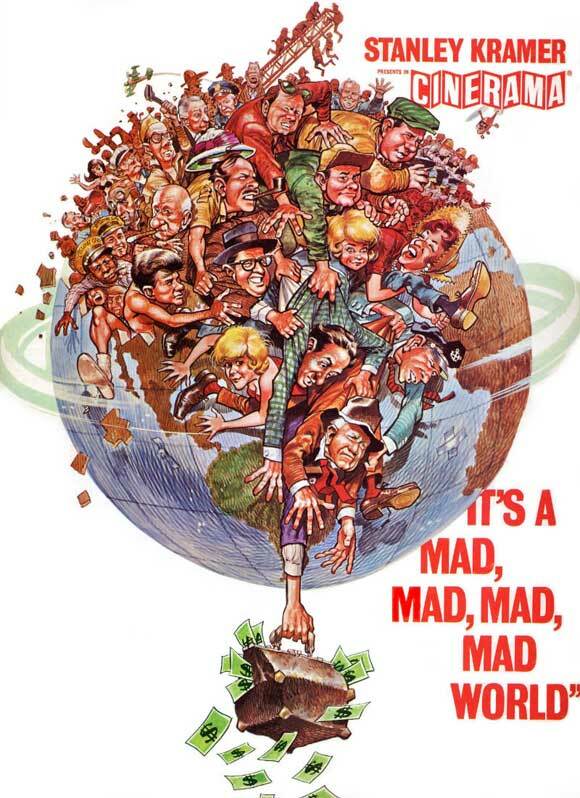 It's a long, long, long, long comedy chase-epic, this 1963 indulgence in slapstick overkill, directed by Stanley Kramer, who was best known for high-minded, serious movies about racism, justice, war and other social ills. 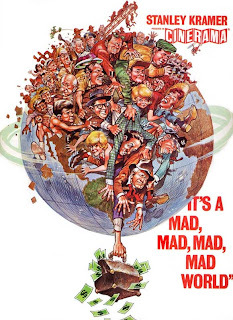 Doing IT'S A MAD, MAD, MAD, MAD WORLD must be seen as his attempt to prove he could do light comedy just as well as preach. But moreover, he wanted to show he could do one of the BIGGEST light comedies conceivable. It's an imperfect analogy, perhaps, but picture Oliver Stone setting skyrocketing-budget records with his own visualization of the Beetle Bailey comic strip. No, please, erase that last thought. Movie ideas are so bad these days compared to 50 years ago that one just might get the green light. In any case, Kramer used his considerable cachet and put it into hiring enough comic heavyweights for ten movies (many of them, like Sid Caesar and Milton Berle, enjoyed their greatest successes on TV rather than the big screen, however), and putting other illustrious screen clowns like Jerry Lewis, the Three Stooges and Buster Keaton in quick-cut cameos and bit parts. The premise is simple enough. On a Saturday morning on a southern California desert road, four carloads of strangers from all walks of life see a driver go off a cliff. Before he dies, the victim (legendary comic Jimmy Durante) confides that he is a famous gentleman-bandit type of yesteryear, and a $300,000 fortune he stole from a fish-cannery is all buried under "a big dubya" in a park 200 miles away. This inspires a free-for-all chase by the witnesses, one they refuse to cooperate with each other in any logical scheme to share the money. (Yes, $300,000. These days that's just what the average 22-year-old graduate owes in credit cards and student loans. Happy graduation, by the way, into a no-jobs economy, you poor unfortunate suckers). The different carloads of treasure-hunters make more allies and antagonists along the way, all in their frantic, bumbling dash to claw up the money first, even though nobody exactly knows what a "big dubya" is. Meanwhile a retiring old police detective (Spencer Tracey) who has been on this case for 15 years, keeps track of the growing mob and the mayhem by secret police surveillance (it's actually pretty Orwellian, in that sense, or am I just not going to let Stanley Kramer have any fun?). Ultimately he too joins in the scramble for the loot. Kramer mounted epic-level stunts, and he violated a major rule of screen farce by making the whole thing last well over two hours (it was originally shown with an intermission break). Result is undoubtedly entertaining, sometimes screamingly funny, but also undeniably elephantine and thin in the what-is-the-point? department. It's all just a big chase. In that sense, no different from what Charlie Chaplin or Harold Lloyd would do in the silent era as two-reeler, and even the comedy gems here get smooshed under the cumbersome weight.